Born on 12 July 1896 in England - next of kin listed as Henry G. Oldham, South Tottenham, England - enlistment forms provide the following: trade as farmer, single, joined the 43rd Regiment on 4 January 1915, no previous military service, Roman Catholic, height of 5 feet 8.5 inches, chest of 35 inches fully expanded, swarthy complexion, brown eyes, black hair. 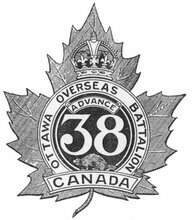 Joined the 38th Canadian Infantry Battalion in Ottawa, Ontario, on 22 February 1915 (number 410012) - taken on the strength of the 2nd Canadian Infantry Battalion on 25 August 1915 - wounded on 15 September 1915 - wounded on 2 February or March 1916. Later worked as a florist in Pierrefonds, Québec - died in 1979. This is my Grandfather. I remember him as a gentle man who loved his work as a florist in Pierrefonds Quebec. He never , ever, spoke of the war. They changed his name to Burgess. This is my Grandfather. He was a gentle man who worked as a florist in his own shop in Pierrefonds QC. until he died. He never spoke about the war. He died in 1979 at the age of 83. Thanks for this Post Ken! Joseph Burgess was my grandfather too. I have his certificate of honourable discharge from the armed forces, and on it his name has been corrected from Burger to Burgess (written over in brown ink with original spelling still visible behind it.